Panama newspapers have invoked Donald Trump in reference to stopping Mexico in World Cup qualifying. Following the election of Donald Trump as president of the United States, all was peaceful in Columbus, Ohio, when the USA and Mexico met to open the CONCACAF World Cup qualifying Hexagonal. Things were amicable to the point that the rival nations posed together for a pregame photo, showing solidarity and unity as a response to Trump's derogatory comments toward Mexicans and Mexican-Americans. In the build-up to Mexico's next World Cup qualifier, things aren't as friendly and docile–off the field at least. 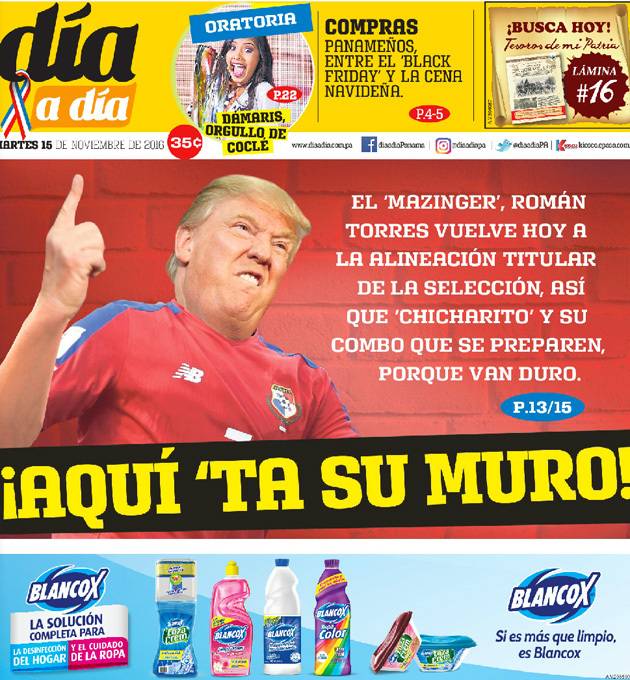 Local Panamanian newspapers Al Dia and Critica have invoked Trump and his dream of building a wall to separate the USA and Mexico, with both opting for headlines that include variations on the theme "Here is your wall," presumably in reference to Los Canaleros stopping El Tri from earning all three points. Al Dia goes as far as photoshopping Trump into a Panama uniform. Mexico qualified for a playoff to reach the World Cup in 2014 at the expense of Panama, which fell to the United States in the final match of the Hex and was pipped to fourth place in the region by El Tri. Both Mexico and Panama won their opening qualifiers of this Hex on the road, with Panama impressively topping Honduras in San Pedro Sula.